Just a bit past two years since breaking onto the author scene with National Book Award-winning Wolf in White Van (Farrar, Straus, and Giroux, 2014), frontman of The Mountain Goats, John Darnielle, is back with his sophomore book writing effort, titled, Universal Harvester (Farrar, Straus, and Giroux, 2017). Starting with the fancifully-colorful cover that reflects shaded blends akin to runny oil found under the occasional car in parking lots, and continuing to the publisher bestowed plot summary mentioning “jagged, poorly lit home video” being found on seemingly random movies – initially copies of Targets and She’s All That – rented from a small video store in the middle America town of Nevada (pronounced Neh-VAY-duh), Iowa, Universal Harvester comes on hard and fast with intrigue boosted by its innocent backdrop of a setting. The book then doubles down on pre-read build up via quiet town happenstance, through central protagonist, 22-year old Jeremy Heldt, who is a staple employee of the independent Video Hut store, from where the hacked films in question, come to be found. Beginning in brief and then opening up to give the book its due, what’s presented at the forefront of Universal Harvester is not what ends up being its primary driving force; no matter how much things might seem to the contrary. A small town mystery revolving around unsettling and intermittently brutal video footage being discovered in the middle of otherwise normal films, practically grabs onlookers by the collar – both in and outside of the story – and demands attention be paid to this organic enigma that stands at the crossroads of Unsolved Mysteries and The Ring. No, Darnielle decided not to go what would have been a very understandable route – giving readers a perfectly linear plot from point A to point B. Jeremy, who is the unfortunate, front line recipient of the news surrounding the problematic tapes in Video Hut, starts out wanting to pay virtually no mind to what customers have brought to his attention but upon witnessing undeniably vitriolic scenes that contend to keep him awake at night following their observation, the shock and discomfort of not knowing permeate from Jeremy to his job supervisor, Sarah Jane and beyond. This sounds like the point where anyone, present company included, would be knee deep in the book and ready to see where the tapes lead. Yet, this is where the book takes its foot off the footage accelerator and literally changes perspective. Written in four parts, Universal Harvester simultaneously weaves and unravels its tale with a combination of traditional third person narration and an unquestioned, (mostly) unidentified first person. Then, on top of that, the book jumps between the present (in this case, the late 1990s through to the early 2000s) and the past. Furthermore, even when contained within a particular point of view and a defined period of time, Darnielle breaks the fourth wall often, referencing how parts of the story might have gone if certain parts are to be believed as true, false, having never happened, or having happened differently (“…None of this is true. Or maybe some of it is. I don’t know.”). If this arrangement feels confusing and intimidating, that’s justifiable to a degree. 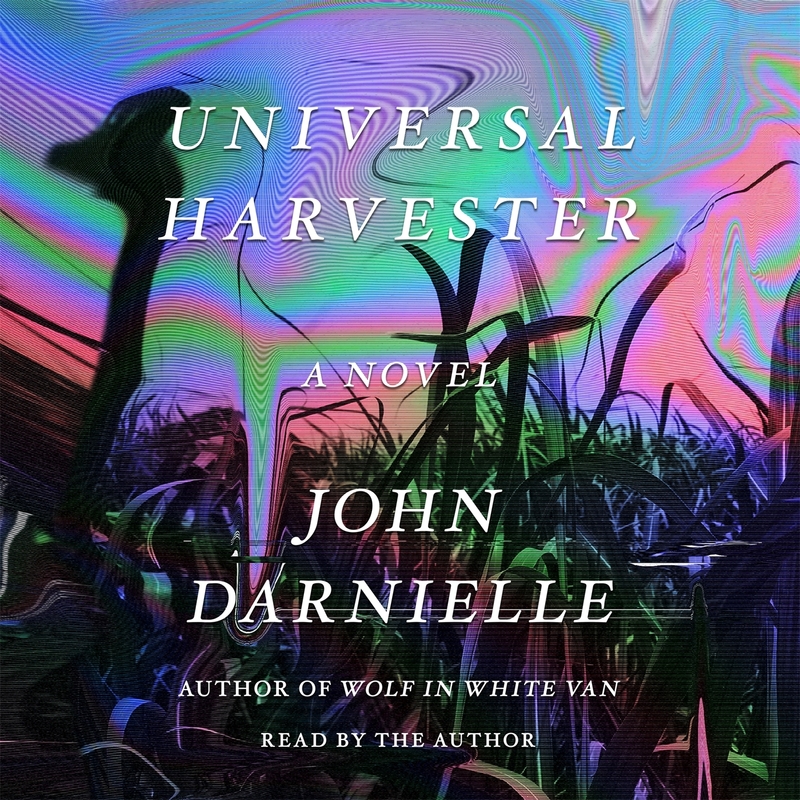 While not a long read, (in the case of audiobook format, only a little over five hours time), Universal Harvester is not a book meant for reading or listening while one’s mind is elsewhere. This isn’t solely due to an assortment of writing techniques or due to some excess of pedantic verbiage but is due to the heart of what make up the book’s actual core of importance: time, grief, memories, and personal introspection. Darnielle’s delivery of the story in audiobook format adds to the impact of these themes, as his reserved and steady narration emphasizes the idea of careful, deliberate thought over adrenaline flooded recitation. The short musical interludes played between various parts of the book add an extra layer of non-verbal support to the mood of the book, as piano, guitar, drum, and synth arrangements contribute distorted, minor, and ominous, or sprightly and upbeat intermissions, depending on the state of the plot. Once the subtleties of Universal Harvester’s themes become the focus of reader reflection, rather than the surface premise of a B-movie thriller, the true strength in the story bursts forth. Death and loss are so prominent in this book that they themselves are almost independent characters. Still, any one character’s particular loss isn’t thrust over readers’ heads repeatedly – at least not in straightforward, blunt terms. Rather, little things, like remembering grief stricken acts or sources of routine comfort that are common places of respite for those left behind stand at this post. Steve’s turning to a particular comfort food and the succinct but poignant explanation behind why it mattered, stands out as an example of indirect, but no less impressive, impact. Such moments, as banal as they might appear to some, are laden with emotional intimacy and personal connection that, anyone who has lost someone and clung to a tradition in the wake of that trauma, will likely find endearing. Ultimately, where Universal Harvester chooses to withdraw from its horror-inspired origins, it instead flourishes in highlighting – by way of metaphors referencing various forms of media, which ties in with the transition of the decades – the significance of histories both individual and collective, alongside the delicate and easily affected, but ever invaluable threads of lineage that follow us throughout our lives. The subsequent distance of these pathways are then determined by one’s own interest and willingness, or not, to keep them. Universal Harvester is out now via Farrar, Straus, and Giroux publishing. Find hardcover, audio, and e-book editions of the book through Macmillan.